Prom night is coming soon and you'd really like to stand out rather than rent the same old tuxedo as all the other guys. Try making your tux out of duct tape. It can be a simple project, where the tux is covered with duct tape, or quite elaborate, with the tux made from scratch using material covered with duct tape. Either way, it will be fun. Buy a tuxedo from a used clothing store. Once duct tape is on the garment, although it can be removed, it will leave residue on the fabric. Select a tux that is a little larger than normally needed; the duct tape will make the tux stiffer to wear. Decide how much of the tux to cover with duct tape. According to the Duct Tape Guys, there is no rule of thumb about how much tape to use. Place the tux on a dressmaker's dummy or on a hanger at eye level. Some people prefer putting the tuxedo flat to apply the duct tape. Put the tux near the cutting board to facilitate assembly. Begin covering the tux's body. Measure from the shoulder seam near the sleeve to the hem and add 1 inch. Stick the end of the duct tape to the cutting board and pull out the pre-measured amount; use the permanent marker to mark the point to cut. Cut the duct tape with the utility knife. Place the cut end of the duct tape on the tux's shoulder seam and lay it straight down the tux's body. Finish by smoothing it on the inside of the tux. Continue to cover the tuxedo's body with duct tape, then move to the sleeves and lapels. If a mistake is made, remove the tape and reapply. Add extras--such as pinstripes--after the basic tux is covered. Pinstripes can be made with thinner strips of tape in a contrasting color, or they can be made with the permanent marker. Mark where the button holes are located and cut them with the utility knife. The buttons can be covered with duct tape, but make sure they fit through the button hole easily. Try on the tuxedo. Move around in the tux to make sure it fits and that there is room to dance, bend, stoop or sit. 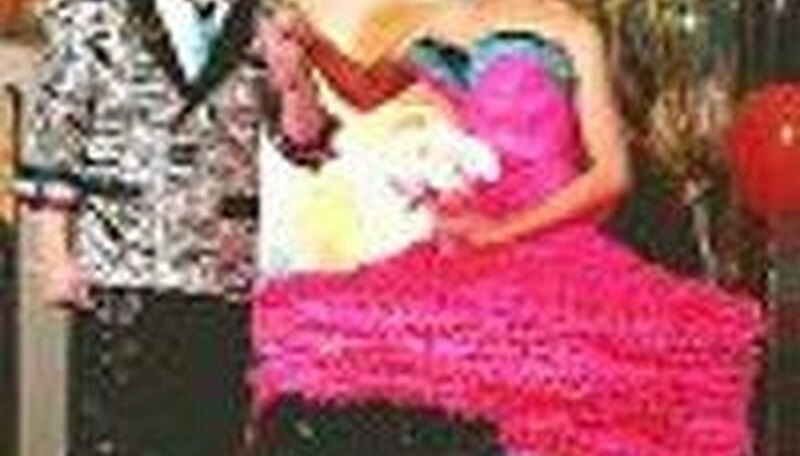 If extra room is needed, Stuck at the Prom Duck Brand Duct Tape Scholarship--a contest for wearing duct tape clothes to proms--recommends cutting an opening in that spot and filling it with strips of duct tape. You should wear undergarments that match the tuxedo's color. If the tux tears, there won't be any embarrassment. You should carry extra duct tape for emergency repairs.